This interview was a pleasure to conduct. Here follows a very special 30 minutes getting incredible insight into the rapport shared by one of, if not the world’s greatest psychotherapist and his most intelligent, caring wife. RT: I have read “All Out!” and was most impressed with the content and the way Dr Ellis skilfully intertwined his childhood with his famed therapy, Rational Emotive Behaviour Therapy. I also know that you contributed a chapter to the book, which was excellent and in many ways very sad and moving to read. You told us of Dr Ellis’ health problems and the ones with his Institute. This may be a loaded question, but what did you think of the book and some of the explosive revelations he made in it? DJE: I think it is an extremely important document and reference source about the growth, stages and evolution in the life of my husband. Al was not only a major force in the fields of psychology and psychotherapy, but also an inspirational “moving-and-shaking-of-rigid-attitudes” humanitarian. He also contributed to this world’s evolution towards more progressive, ethical and rational thinking. He very much wanted to finish the book before his passing, but the decline of his health in his final months prevented that from happening. He worked very hard to finish it, but it just was not possible. I wrote the final chapter of the book. If he had been able to complete it, he would have written about some additional people in the “Influences” chapter. Unfortunately he did not get around to doing so. I love the book and its engaging style of the same manner that he would use if you were sitting with him in his room and he were conversing with you. I love Al’s straightforward, honest approach and his typical unabashed willingness to be completely open about himself and his thinking. He did this to demonstrate his human-ness, his fallibility, the lessons he learned from mistakes and undesirable outcomes in order that readers might be inspired to accept themselves and any of their flaws and mistaken actions unconditionally as he did and so that readers might be encouraged to learn from their mistakes as he did – and grow from them. Throughout his life, my husband used what he learned about his own and others’ behaviour to help himself and the lives of others. His goal was to empower as many people as possible to cease creating unnecessary suffering in their lives, so that they might experience greater joy. He was a great model of a person who is authentic, aware, honest, compassionate – and most dedicated and vigorous in his actions to help others. RT: What was the secret to the great mutual adoration and joy that you and your husband shared? DJE: No secret actually, it was just simple, pure, honest love, cherishing so many aspects about the other and willingness to accept anything in the other that we did not prefer. Al would often say how rare it was for two people to be so remarkably compatible in so many ways as we were. We shared the same ideals and goals. We respected life and were grateful for our lives. Both of us desired to contribute to one another and to this world in positive ways. We enjoyed each other’s accomplishments and were sensitive to one another’s disappointments. I automatically preferred to put Al’s well-being before mine – it was a natural inclination and in no way a sacrifice. I adored him more than I will ever be able to say in words. Many people have commented on the depth of love they observed that we shared and praised me for my devotion to Al – especially when he was ill. I feel sad that my dedication is noteworthy and not a natural path of life for some. I saw the same loving behaviour displayed by my parents towards each other, towards me and to others in our family and to their friends. So for me it is natural, normal – use whatever word you like – to want to do all that we can for the ones that we love. RT: Your husband described you in the book by saying” Debbie has had the most profound and positive influence on my life”. What is your recipe for positivity? DJE: My recipe is making the choice to remember and be grateful for the good things in my life. In our toughest times, Al and I cherished, appreciated and felt gratitude for that which was still good in our lives. Throughout the day and night, he and I would cherish being together and the love we felt. No matter how bad things are, they can always be worse. So the recipe for realistic (not Pollyanna-ish) positivity is to keep things in healthy perspective and to remind ourselves daily of the things we have to be thankful for. RT: What have you yourself learned from your relationship and the difficult experiences you and your husband have gone through? DJE: I have learned that by using the principles of REBT and by working hard and making the effort to keep things in healthy perspective, that I can maintain my inner and outer stability. In Al’s final years, he and I were not treated well, but by my choosing not to focus too much on, or dwell on, the bad actions against us, and by focusing on the tasks that had to be done in the care of my husband and by relishing the enjoyment I had with him, I learnt that even if others have some outer power in imposing restrictions in my life, no-one can have victory over my inner state and well-being unless I allow them to have it. I refused to allow myself to give too much energy to the bad, very bad happenings; I focused on Al, my one and only priority and in so-doing, I prevented myself from succumbing to debilitating depression or illness. RT: What are your fondest memories of your husband? Are there any really funny ones that you can share with us? DJE: Every minute with him was a joy, his outrageous, wise and witty humour and smile and enthusiasm and absorption in his work and his ways of expressing his love and appreciation for me. There are so many memories. Our quiet stillness and pleasure in just hanging out together. The intensity of our love. His boldness and courage in fighting for what he believed in. His authenticity in practicing what he preached. We enjoyed a remarkable rapport when we worked together. I felt energised and elevated when we worked and felt humbled and grateful that he enjoyed working with me. have to remove the entire large intestine, Al said “at least they are not taking my balls”! In 2006, when Al had serious pneumonia we were told he would have to have a stomach tube inserted and that for the rest of his life it was most likely that he could never take solid food or drink liquid through his mouth again. Not good news. Again, he could joke and he said “Oh – no more strawberry shortcake”! During workshops and public presentations, people would roar with laughter as Al put things into healthy perspective through the expression of his unique style of humour. 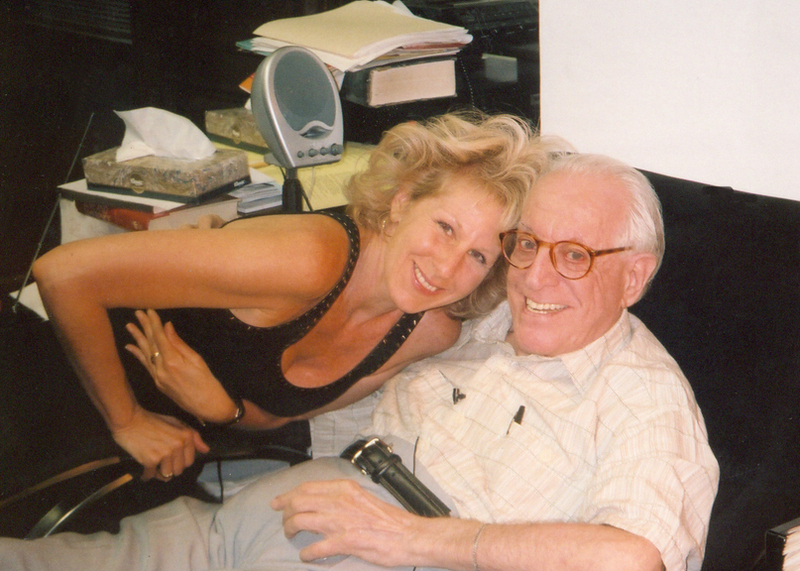 For me, being with Albert Ellis was being next to greatness. His intention was to help people suffer less and be happy more, and to this end he formulated his REBT tool and made a lifelong effort to share it with as many as possible. Hundreds of thousands have shared that REBT helped, and in some cases saved, their lives. He practised what he preached. Coming from his authenticity, there was an alchemy that often happened between him and his clients and audience members which helped to empower those of them who were ready to make positive changes in there lives to do so. To be with Al was to be in the company of greatness. My gratitude for the life and intimacy we shared is immeasurable and eternal.